This composition, by Montreal photographer Josée Houle, combines my photo of a wall at Kyoto's Myouhouin Temple (妙法院), which I published on a post in 2012, with photos of a model being splashed with colored milk. First, the model took the pose with all the pieces of the outfit that wasn’t liquid, to create the basis of the final photo. Once the perfect shot was taken, every accessory was taken off and then, the process of splashing milk on the model could start. While the model taking and keeping the same pose as in the final photo, two assistants started splashing and pouring yellow coloured milk on each one part of her body at the time, repeating this process again and again, until many usable shots of the milk splashing were taken. 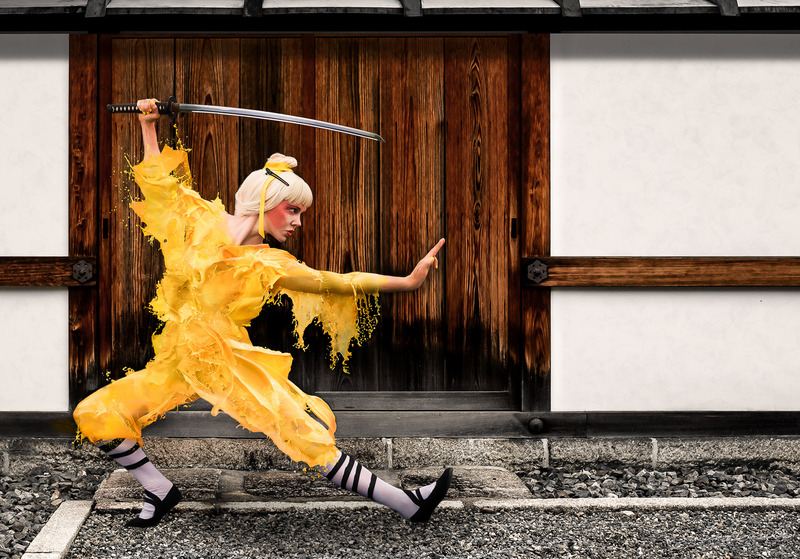 After, on the computer, a selection of the best shots of milk was done and then combined, one layer over the other, on the final photography, to create the entire kimono on the model. A background was added to create a context and the whole picture was blended together to give the most realistic yet fantastic result possible. It sounds really messy, but fun, and the result is certainly interesting and fun. She posted the photo, along with information about it, on Facebook, and also some behind-the-scenes photos here.